Luke was more than ready to leave his childhood home as he stepped into the tiny kitchen. “She’s gone!” his mother announced with a gleam in her eye and a triumphant twist to her mouth; even before he’d stepped over the threshold onto the stained linoleum. “Gone? Who?” Luke replied, feigning confusion, though fearful cracks had begun to fill his heart at the words. “That simpering Bonnie, the neighbour’s daughter” his mother confirmed, her beady eyes reading his face with such an unmaternal coldness that froze his heart even further. “Must you go so far away? What if I’m taken ill or something?” She had an uncanny knack of making him feel guilt like a creeping cold through his entire body. “Then I’ll come home again” he lied, thinking about her now. His Bonnie, the light of his entire existence. The woman he intended to marry. The woman he hoped had arrived at their rendezvous. The woman he feared would see him as a failure and a dead loss and be nowhere in sight when he arrived at the railway station to meet her. Yet her kindness, warmth and love had been the antithesis of his mother’s cold, cruel indifference. “Believe in yourself” he heard Bonnie’s mantra as though she were whispering in his ear. “Believe in us, I love you” she had said to him time and time again when his mother had threatened to thwart their plans for a future together. They had finally agreed to make it look as though they were not together anymore, that she had lost interest and gone. Yet even though it was their plan, Luke was still fearful that this beautiful, compassionate woman would have found someone else, someone better and really have left. “That’s your mother’s voice you’re hearing. Don’t listen to it!” Bonnie’s mantra whispered through his consciousness. “Bye then” he said with renewed determination. A hint of rose water made contact with his lips as he kissed his mother’s cheek for what would be the last time. He felt sorry for her, but he must be strong. His life with Bonnie was all that mattered. His future was not this stifling hell-hole where emotional manipulation and unfair culpability were his constant bed-fellows. “You’re better off without her!” were his mother's parting words. He turned away smiling. I’m better with her. Jenn at www.youknowthatblog.com has dared us to haiku. Crossing before the train comes. A dare's a dare, right? How will I ask her? Thanks to everyone for their well wishes. I am feeling much less foggy headed, which is great, though energy levels are still not 100%. Sorry everyone I've been feeling incredibly sluggish again lately, so my creativity and blogging has been greatly reduced. I had a visitor on Friday and my brain felt so fogged I couldn't remember how to make a mug of instant coffee so I just made cafetière coffee, because it 's what I usually drink so it was easier to make! When I go to put stuff away in a cupboard I find myself opening the wrong cupboard door! It's baffling and slightly worrying to be honest. I've missed out on a few Blogfests, so if you know about any good ones please let me know. I have, however, completed the Young Mewsletter project I started for my local branch of Cats' Protection (with a word search, book reviews and an interview with a young supporter. Plus a little piece about the stigma attached to the humble black cat). I'm pleased with the result and hope it will generate some funds to help my hard working, dedicated colleagues manage the moggies in their care. So how are you all at the moment? Do you feel up-to-date with your blog followers? Are you up-to -date with your Campaigners Group members? Do you feel generally SWAMPED and SLUGGISH or full of VIM and VIGOUR? Are you able to fit a whole story on the back of a postcard? Some of you may remember my posting in the campaigner challenge. Doesn't it look great on a postcard? 'Postcard Shorts runs an editorial panel, which rates all stories submitted. A story requires the majority vote from the panel in order to be published'. 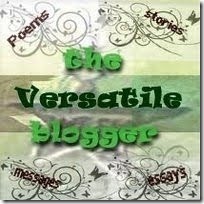 I'd also like to Thank Blogger Girlz for awarding me the Versatile Blogger Award. Sorry I haven't submitted a RFW piece this week, my brain isn't feeling creative enough! Was shunned by the guys in her set. Mine received an honourable mention. Over the past few days I have been busy and also poorly and extremely tired. Also the shower (of 20yrs) decided to pack up and the boiler (of only 8 yrs) decided to do likewise, so we got all immersional resorting to the Immersion switch for our hot water, at least, while we awaited the nice repair chappies. This week, Jenn at www.youknowthatblog.com had given us free reign to choose our own theme. This time I haven't included the accompanying images, so that you can savour these words, raw, without the visual seasoning. The other day our 2yr old cat, Borage, came in from outside and like an excited toddler, started telling me a long story about how he was caught in a heavy rain shower and that he was very wet. When he failed to get my attention as I tapped the keyboard he said a whole lot more and so I had to dry him off and then he was happy, but he wouldn’t stop meowing about it until I did. It was the funniest thing! If you have a blog and you'd like to take part, all you need to do is post a photo of your chosen one (dead or alive) along with an explanation why you've picked that person. Okay who did I always long with all my heart to be? Someone beautiful, intelligent and able to do magic of course! I was desperate to change my name to Samantha (though the name was considerably longer than my given name at the time which posed problems). Later I imagined having a little girl called Tabitha. With magic, life would seem more manageable: the bullies, the complications at school, the difficulties at home all sorted with a little twitch of my nose. Perfect! Who would did you long to be? For some inexplicable reason this has posted a week early. Aaargh! As I already have a few comments I will leave it here and refer to it again on the blogfest day. Okay just to say I am sorry if any of my comments offend anyone who loves any of these films, but they just didn't do it for me. So which will I include here? The Legend of Boggy Creek. I saw this when I was 10 yrs old at a drive-in movie theatre in Canada. Then I saw it on TV as an adult and it didn't hold up to scruntiny. Even the apparently petrified tracker dogs were happily wagging their tails. I loathe films that are all action crashing cars, explosions, shooting and no real story and those with a thin uncomplicated story line and those which draw themselves out 'like pulling hens teeth', as my Pa would say. And who could endure the 1990 version of Lorna Doone starring a very young Clive Owen and a very young Sean Bean? It is full of disjointed scenes which very poorly convey the sentiments of the story. Remember Me starring Robert Pattinson. Now don't get me wrong I loved him in Twilight and Harry Potter﻿, but this film is seriously depressing and dull. Then there's Red Riding Hood with Amanda Seyfried and a host of other well known actors. The best bit was when we discovered who was the wolf. The plot was very thin. 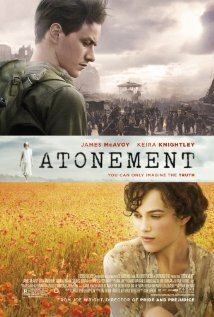 And Atonment with James McAvoy (one of my fav actors) and Keira Knightley (whom I also like). I'm afraid for me the book and the film were as long drawn out as a bad bout of toothache. The English Patient, at the end of which my hubby exclaimed "And this won seven oscars!" (which pretty much summed up how I felt about it... another bout of toothache) His comment cracked me up! I am Legend. Again I probably love all of Will Smith's other films, but this one was diabolocal! It had no meat on its bones for me. “I’m sorry, so was I” he’d laughed apologetically looking every bit the amiable, gentle giant, but failing to conceal his disappointment. Commanding , smartly dressed and somewhere around 6ft 3” had been her instant impression of him. It was always gratifying for her to be seen with taller men, it didn’t make her look so unusual, so freakish. “Could we share?” she said watching his brown eyes scan the restaurant for signs of any other vacant tables, yet seeing none he’d turned back to look at her and his stomach gurgled impatiently, embarrassment crumpling his face into an apologetic grimace. “I think that’s settled then” she’d resolved with a friendly laugh and gestured her hand towards the seat in front of her. “I’m Caroline.” Tantalising aromas of fresh ground coffee, warmed croissants and full English breakfasts had also aroused her appetite. “And I’m Bernard” he’d replied, his smile as utterly disarming as his physique was captivating. She noticed him quickly avert his gaze from her snugly fitting jumper as she shrugged off her black, cashmere coat. A smile of secret pleasure had spread across her face and she raised a teasing eyebrow. “The strong brave bear” she mused as she placed her coat over the only other available chair at their table. She sat down, the vibration travelling along the metal tubular legs of the chair so that they wobbled like a percussion instrument. Bernard threw his coat over hers and sat opposite. “Sorry?” he responded, his eyebrows pinched together in puzzled curiosity at her obscure remark. “Bernard, it means strong, brave bear. Sorry it’s a hobby of mine. I love to see whether people’s given names actually match their personalities!” she said, finding comfort in the gabble of words that spilled from her mouth, distracting her from dwelling on her rumpled composure. “OK then, so what does Caroline mean?” Bernard challenged, rubbing his forehead as though massaging away a headache. A bubble of laughter had caught Bernard off guard “No-one could accuse you of being manly or little, but as for womanly…” he’d let the words hang in the air. Wow I have been awarded Featured Writer yet again! Thank you so much! To my personal chagrin, a blog post I had scheduled for tommorrow posted up today, so I had to remove it out of respect, as it didn't seem appropriate for today. Prayers and Thoughts go to all those affected by the tragedy that took place 10 yrs ago. It has to be one of those moments when the world felt as though madness ruled. It is so hard to believe that anyone could so deliberately harm another human being, let alone 3,000 other human beings and the enduring legacy of their families' grief. It is so sad. Today is my Dad's 77th Birthday, so I am sending him my prayers and love too as he is suffering from Alzheimer's and PCA. AND I would like to pass it on to Rachna's Scriptorium for her wonderful blog full of useful writerly tips. Do you write or read historical fiction? What draws you to the genre? I'm not much of a historical novel reader, though I love costume dramas in film and TV. WHY? It's probably because I often find the dialogue too flowery and convoluted on the written page. Someone who handles dialogue so seemlessly is Sue Birtwistle. Her dialogue is representative of the era and yet it flows so beautifully from the actors mouths. I've been reading this text which I thoroughly recommend if you are planning to have a go yourself. It is also great for pointers that you can apply to other genres.I've already been caught out by amateurish mistakes. Who would you recommend? What era's and sub-genres do you like? Any good YA historical reads you'd recommend? Slow, Slow, Quick, Quick, Slow! I've just visited a great blog that is painfully slow to load and flips about all over the place when I try to leave a comment. I temporarily set up a poll in the side bar to see if my blog has been driving anyone bonkers. Is it easy to leave a comment? AND I do have an animated slide show gif on the sidebar, but I haven't added any other such things as I know they are the most responsible for the loading and bouncing away from the comments and verification problems (like a yoyo on acid) that other sites have. Have you got a haiku to share? Since I entered the following groups: Literary Fiction; YA; Romance and Chick Lit in the campaign and since I have written a number of romance pieces recently, I feel I should present this one as YA or Literary Fiction. The door swung open, letting in a shaft of light that crept across the floor, chasing away the darkness like a seeping dye. “Time to get up!” the female voice snapped. I replied in deep, throaty groans. The sunshine continued on its journey across the bedroom floor, brightening up the pages of my dull physics homework and the crumpled heap of discarded socks and boxers that added to the rancid odour in the room. Lying in the cosy warmth of the bed, I awaited the avalanche of grief from my mother for not opening a window to let the fresh air in and the smell of me out; for not putting my laundry in the appropriate basket; tidying up or getting up at a reasonable hour. Then, as the sunshine crept over my bed, picking out my shape beneath the duvet cover, I suddenly shrank. My eyes snapped open as the cold dawning horror that I was not at home, but staying with relatives, shook me awake. My gaze travelled up the fit, cute body of my cousin. Reaching Janice's face I noted her deep hazel eyes sparkling with hilarity, as she watched me squirm, before the door swung shut. Don't forget to vote for mine if you liked it over at the linky Thank you. Dance to the rhythm of romantic music. Let's see that setting sun and feel those heroic arms about us. Maybe you've got a holiday romance going down, or perhaps it's a beach party and there's a heart stopper of a guy there and you're drooling! Whomever sets your heart pulsing let's hear about him. 400 words max. I notice him as soon as he enters the nightclub. The beat of the loud music has already sent my pulse pounding with anticipation. It’s as though a spotlight has picked him out from everyone else in the room and is following him as he moves with liquid ease. I realise I am smiling. I marvel at how he moulds himself so seamlessly into the crowd and yet becomes its very core. The lads admire him, while the girls are drawn to him like butterflies seeking his nectar-rich blossom. His smile radiates across the room in my direction, momentarily stopping my heart. I catch my breath, the sensation as thrilling as a roller coaster ride in freefall. “Hey Joe!” someone shouts, stealing his attention away. Like a child who has tasted their favourite ice cream, only to have it snatched from their grasp, I feel bereft. “What I wouldn’t do to get a piece of him!” the blonde next to me is saying. She reeks of migraine-strength perfume, as she leans against the bar sipping from a pint of lager. Although I don’t look at her, I know her eyes will have momentarily lost focus while she imagines herself claiming a piece of him. I don’t reply. My mind becomes lost in the question: which piece of him, I wonder? A touch of skin on skin, warm, soft, firm and passionate. Rich, glossy chestnut brown hair, dark eyes and supple, fit physique that will make perfect progeny. A desperate longing need to be together. Special moments in a shared joke, an anecdote of something that happened in the day. Declarations of love panted and urgent, then sweet and slow. A forever-love that matures like a fine wine over years of nurturing. And then here he is in front of me. The blonde stands up, stretching out her long body with feline stealth. She throws a knowing, proprietary smile in my direction and leers provocatively at him. Joe’s strong hand brushes away an auburn wisp from my cheek, then slips gently under my chin as he pulls me closer, planting a soft, intimate kiss on my lips. I place my left hand, with the sparkling rock on my ring-finger, over his shoulder and kiss him back. I’m thinking: It’s not a piece of him I’m settling for, it’s the whole package. 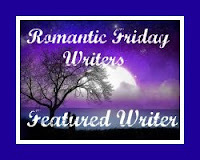 This story has been awarded the coveted Featured Writer's badge jointly with Roland for this week. Thank you!